props for hosting it on github so all I have to do is a git pull to update. I agree git is just awesome. The best versioning system out there. I've just updated my first post with new screenshots. Some minor bugfixes and changes were made. in particular smaller font sizes, hover markup and better widescreen support. very nice theme!!! thanks for your amazing work! I'm not sure if thats a good idea. Depending on the feed, the outcome will not always be pleasant. To align images you can add the following code into your reeder.css just before /* Replace images */. It will center the images. thanks very much, glad you like it. Awesome theme, but I'm partial to a white background so I hacked it up some. Hope you don't mind. Adding it here just in case anyone else was turned off by the color scheme. Last edited by kachaffeous on 07 Jun 2013, 03:06, edited 1 time in total. kachaffeous wrote: Awesome theme, but I'm partial to a white background so I hacked it up some. Hope you don't mind. Adding it here just in case anyone else was turned off by the color scheme. Thanks, this does make it look more like Greader, and uses less bandwith, as it's loading less pictures. of course I don't mind, do as you like. Hi, could you please enable word-wrapping for long titles? hmm do you have to lastest version? My titles and feed entries wrap automatically in Combined Feed Mode and 3 Coulumn Mode. Could you specify more clearly. 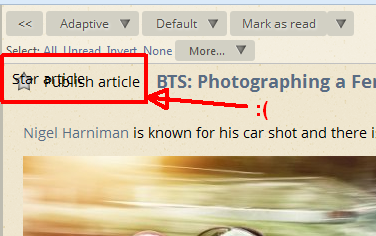 I checked and on my version the word wrap is enabled, see screenshot. I'll make some test next week and will get back to you. I saw that my current trunk version was a bit different then the last github version. Please check if the word wrap work with that. screenshots and desciption on the first post are updated. breaks word-wrapping. If I change the white-space rule to "normal" word-wrapping works fine. Could someone help me out with why this is happening in Firefox. Any way I can fix this?